Network assets can range from the high-end routers, switches, servers, hosts and firewalls to the applications, services, operating systems and other software assets deployed in your network. An updated inventory of hardware and software assets is vital for decisions on upgrades and purchases, tracking warranty status, or for troubleshooting and security reasons. And given the size of current networks, it’s essential that the asset inventory process is automated to save you time and ensure accuracy at all times. Some network management software solutions can discover, map network assets and create inventories that automatically update to reflect changes in device configuration and status, and present the information to the administrator through well-organized views and comprehensive reports. WhatsUp Gold comes with the capability to create a complete asset inventory. 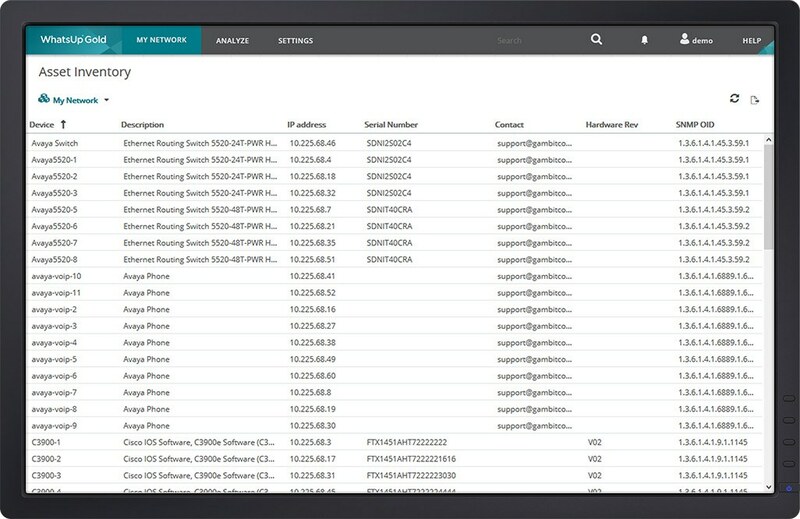 This network discovery tool uses a variety of technologies and protocols — ARP, SNMP, SSH, Virtual Infrastructure Management, IP addressing, ICMP, LLDP, WMI and Telnet — to automatically discover, locate and collect comprehensive device information across routers, printers, switches, servers and firewalls. The asset information collected includes the manufacturer/model, ID, serial number, hardware/software and firmware versions, chassis ID, module inventory and information about device hardware such as power supplies and fans. WhatsUp Gold can categorize devices from a wide variety of vendors including Cisco, Foundry, HP, Nortel, 3COM, Extreme, Dell, Net gear, DLINK and VMware among others, thus making it an ideal tool to discover and draw up the network inventory for heterogeneous networks.